In the wake of the recent bankruptcy of Mexicana Airlines, Air Canada has introduced nonstop service from both Vancouver and Montreal to Mexico City. These were routes formerly handled by Mexicana. There will also be increased nonstop service from Toronto. Visit the Air Canada website for information about schedules and fares. 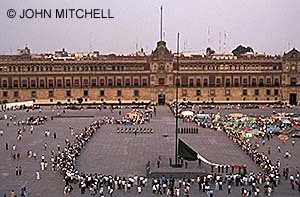 Click on the photo below to see images of some of Mexico City’s famous landmarks. P.S. Christmas is just around the corner, so I’m offering 15% off all prints, greeting cards and other products ordered through my stock photography website. Enter promotion code XMAS10 at checkout.